Traveling across the largest and most beautiful glaciers in Ecuador. Practicing glacier techniques and alpine ice climbing on the massive ice formations and many crevasses near the peak. is Ecuador’s third highest mountain. While Cayambe (5.790 m/18,996 ft) is only the third highest peak in Ecuador, it is the highest point along the equatorial line. It also is home to the only patch of snow and ice located on the equator. Cayambe lies 70 km (43 miles) northeast of Quito, along the interface where the Eastern Cordillera meets the Amazon basin. It is located in the Cayambe-Coca National Park. The Park was established in 1970 to ensure that the mountain and the unique flora and fauna inhabiting the volcano is protected and accessible to all. Cayambe is home to the largest and most beautiful glaciers in Ecuador. It is known for its multitude of good climbing opportunities on these interesting, ever evolving glaciers. There are massive ice formations and many crevasses near the peak for which you can practice glacier techniques and alpine ice climbing. While Cayambe offers areas of technical climbing, the normal route to ascend the peak does not require these technical moves. It does require a high level of route finding skills, to navigate its ever changing crevasses and glacier movements. 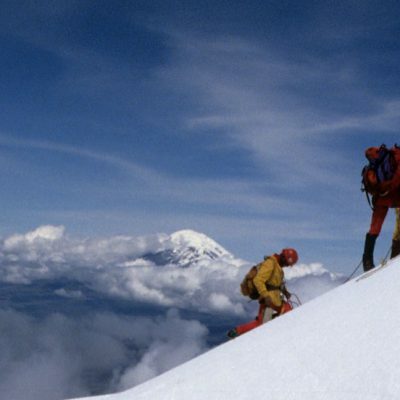 This makes Cayambe one of the more exciting and challenging ascents in Ecuador. In fact, Cayambe wasn’t even summited until 1880 by a team comprised of Edward Whymper and the Carrel brothers. Like all snowcapped peaks in Ecuador, avalanches are common during the day due to the more direct angle of the sunlight characteristic of regions this close to the Equatorial Line. As a safety measure, we will climb at night and reach the summit by 7:00 a.m., this will enable our safe return to base camp before the snow pack becomes too warm and soft. Drive for two hours up to the Bergé, Ruales, Oleas Refuge (4,650 m, 15,257 ft) in the Cayambe-Coca National Park. Here we will have a boxed lunch while we get used to the altitude. Then review climbing skills and safety and prepare our equipment. Our day starts early to ensure we have enough time to reach the summit by 7:00 am. We begin climbing up to the edge of the glacier to meet up with the standard route. Under good weather conditions, we will make the ascent in roughly 6 hours. At the summit we will enjoy the views then begin our 3 to 4 hour descent back to the hut. Then drive back to Quito.